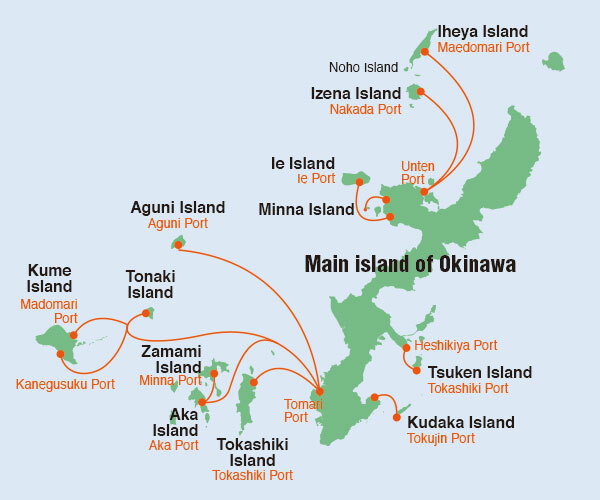 Tsuken Island can be accessed by regular and high-speed passenger ferries. Ferries leave from Heshikiya Port, which is situated near the tip of the Katsuren Peninsula. *Occasionally, there will be times that either the Kugani or the high-speed ferry service may not be available. In that case, another ferry will be running. *Please be onboard the vessel at least 15 minutes before the scheduled departure time. *Reservation required for shipping vehicles. *Early reservations are recommended as transit is on a first-come, first served basis. *Vehicle fares also include the fare for one person. *Vehicle must be cleared 30 minutes before the scheduled departure time. Please check the official website of Kamiya Tourism Co., Ltd., to confirm seat availability and the latest schedule. For more information: Kamiya Tourism Co., Ltd.